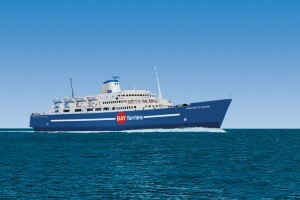 The Princess of Acadia sails to Digby from Saint John, a city in the nearby province of New Brunswick. It runs year round, twice a day in peak season, between June and October. You can take your car, RV, motorbike and even your favourite pooch or cat on board. There are restaurants and entertainment on the ship as well as free wireless internet so it’s not hard to kill time during the 3-hour trip. Fares vary by season. In the low season, one adult with a small vehicle could expect to pay $220 return, including a fuel surcharge. There’s a Super Saver fare on some sailings that cuts the cost by 25% but you’ll be charged if you want to change or cancel your travel plans. You can go as a foot passenger, without a vehicle. Adults pay $60 each between June and October and $50 the rest of the year. Return tickets have to be used within a month.